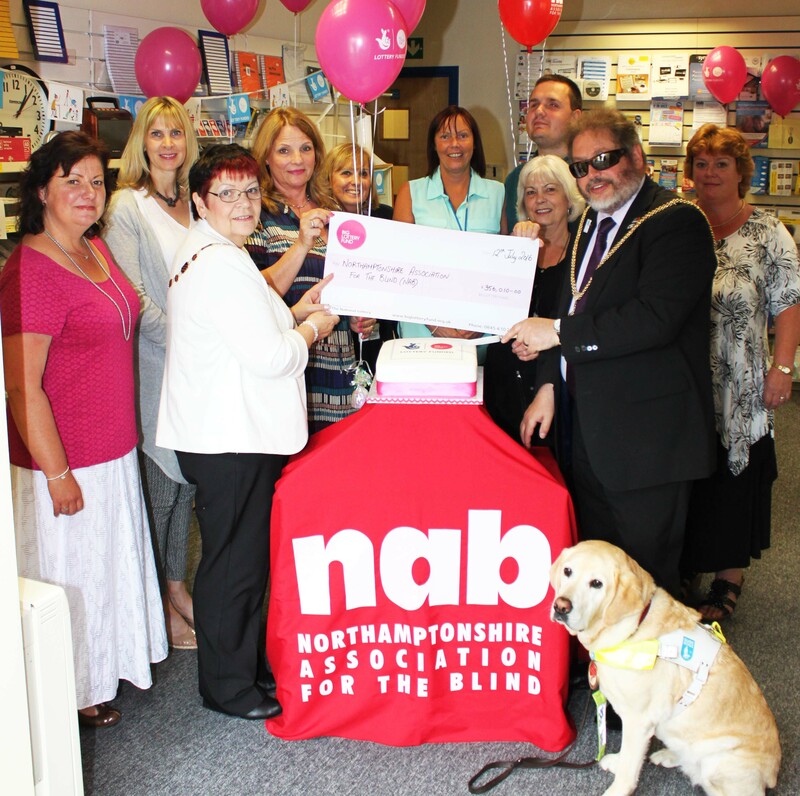 Northamptonshire Association for the Blind (NAB) is today celebrating being successful in gaining a £356,010 award from the Big Lottery Fund. The money comes from BIG’s Reaching Communities programme, working across the country to help improve the lives of disadvantaged people. NAB Trustee and Mayor of Northampton Cllr Chris Malpas, along with his wife Lynne and guide dog Verity, popped in to Northampton Sight Centre to celebrate the news with members of our Community Team. Launched in 2012 with the support of £300,000 from the BIG Lottery Fund, this new funding helps secure our Enable Project, which help thousands of the county’s blind and partially sighted adults and children to live independently within the community and make the most of what life has to offer, for a further 3 years. 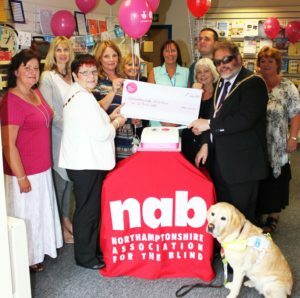 It is estimated that there are over 19,000 people living with sight loss in Northamptonshire who could benefit from NAB’s Enable Project, which provides a range of complimentary services including Home Visits, Emotional Support, Advice on health, welfare, wellbeing, and coping with daily living tasks, Assistance with specialist aids, equipment and new technology, Interest and Social Groups across the county, Befriending and Sight Centres in both Northampton and Kettering – plus a Mobile Sight Centre which travels the county. Listen to Alex on BBC Radio Northampton talking about the award (12th July 2016). Today’s awards have been made through the Big Lottery Fund’s Awards for All and Reaching Communities programmes. Awards for All provides grants between £300 and £10,000 to voluntary and community organisations and Reaching Communities awards larger grants of £10,000 and above. The Big Lottery Fund is the largest funder of community activity in the UK and is responsible for giving out 40% of the money raised by National Lottery players for good causes. Every year they invest over £650 million and award around 12,000 grants across the UK for health, education, environment and charitable purposes. Since June 2004 The Big Lottery Fund has awarded over £8 billion to projects that change the lives of millions of people. Since the National Lottery began in 1994, £34 billion has been raised and more than 450,000 grants awarded.